Simulink® allows you to specify a block sample time directly as a numerical value or symbolically by defining a sample time vector. In the case of a discrete sample time, the vector is [Ts, To] where Ts is the sampling period and To is the initial time offset. 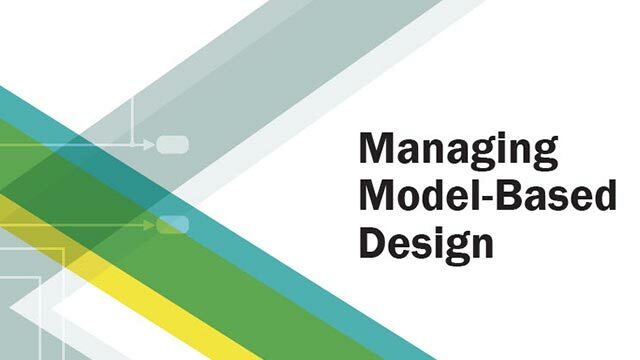 For example, consider a discrete model that produces its outputs every two seconds. If your base time unit is seconds, you can directly set the discrete sample time by specifying the numerical value of 2 as the SampleTime parameter. 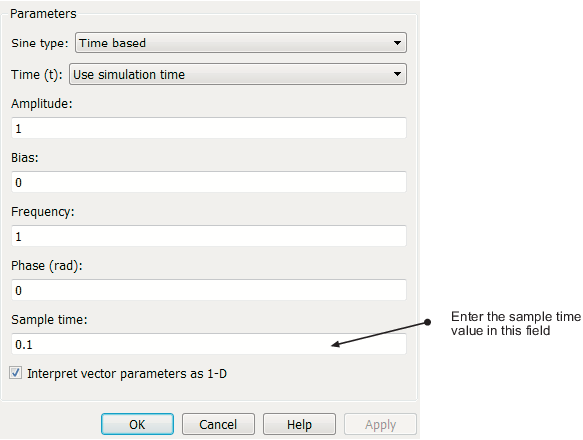 Because the offset value is zero, you do not need to specify it; however, you can enter [2,0] in the Sample time field. For example, suppose that a model defines three sample times: 1, 2, and 3. Further, suppose that it references a model that defines two sample times: 2 and 3. In this case, blocks operating at the 2 sample rate appear as green in the parent model and as red in the referenced model. It is important to note that Mux and Demux blocks are simply grouping operators; signals passing through them retain their timing information. For this reason, the lines emanating from a Demux block can have different colors if they are driven by sources having different sample times. In this case, the Mux and Demux blocks are color coded as hybrids (yellow) to indicate that they handle signals with multiple rates. Similarly, Subsystem blocks that contain blocks with differing sample times are also colored as hybrids, because there is no single rate associated with them. If all the blocks within a subsystem run at a single rate, the Subsystem block is colored according to that rate. You can use the explicit sample time values in this table to specify sample times interactively or programmatically for either block-based or port-based sample times. The following model, ex_specify_sample_time, serves as a reference for this section. In the Simulink model window, double-click the block. The block parameter dialog box opens. Enter the sample time in the Sample time field. Following is a figure of a parameters dialog box for the Sine Wave block after entering 0.1 in the Sample time field. To specify and inspect block-based sample times throughout a model, consider using the Model Data Editor (View > Model Data Editor). On the Inports/Outports, Signals, and Data Stores tabs, set the Change view drop-down list to Design and use the Sample Time column. For more information about the Model Data Editor, see Configure Data Properties by Using the Model Data Editor. Double-click the Rate Transition block. The parameters dialog box opens. Leave the drop-down menu choice of the Output port sample time options as Specify. Replace the -1 in the Output port sample time field with 0.2. For more information about the sample time options in the Rate Transition parameters dialog box, see the Rate Transition reference page. As with interactive specification, you can enter just the first vector component if the second component is zero. To access all sample times associated with a model, use the API Simulink.BlockDiagram.getSampleTimes. To access the sample time of a single block, use the API Simulink.Block.getSampleTimes. You can design custom blocks so that the input and output ports operate at different sample time rates. For information on specifying block-based and port-based sample times for S-functions, see Specify S-Function Sample Times . Since the execution of a Simulink model is not dependent on a specific set of units, you must determine the appropriate base time unit for your application and set the sample time values accordingly. For example, if your base time unit is second, then you would represent a sample time of 0.5 second by setting the sample time to 0.5. To change a sample time after simulation begins, you must stop the simulation, reset the SampleTime parameter, and then restart execution. Types of Sample Time | What Is Sample Time?